A team of 12 specialist nuclear divers from Underwater Construction UK Ltd has completed their mission to deal with radioactive waste in Sizewell A's nuclear fuel storage ponds, nearly two months ahead of schedule, Magnox Ltd reported on 1 August. The divers explored new depths at the Sizewell A ponds to cut up former fuel storage skips and other redundant equipment as part of work to decommission the old nuclear station. Their first UK nuclear dive took place at Magnox’s Dungeness A Site in 2016, and the experience gained there has been used at Sizewell A, where work began in October 2017. The divers, shielded from radiation by the water in the ponds, cut up and “size reduced” all of the 35 skips which remained in Sizewell A’s ponds. The team also cut up around 100t of other redundant equipment before removing all the radioactive sludge from the pond floor. During the operational life of the plant, the ponds were used to store thousands of used nuclear fuel elements, held in metal skips, after they were discharged from the reactors. After the last of the fuel was transferred to Sellafield for reprocessing, the skips and other waste items – including radioactive sludge – were left in the water. Conventionally, pond clean-out is done using remotely operated equipment to lift the whole radioactive skips and other pond furniture clear of the water, exposing them to the air, where they are carefully cut and decontaminated. This process is slow and poses the risk of radiation exposure for workers. 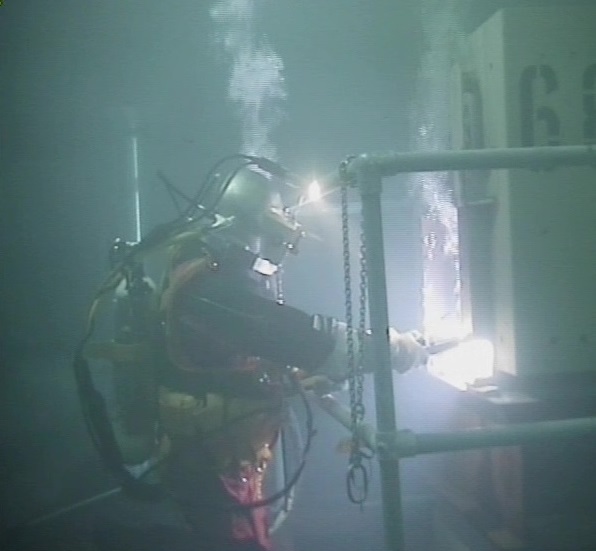 Using the underwater decommissioning technique, radiation levels for workers were around 20 times less than with conventional methods for decommissioning the waste items in the air. The diving technique also has a reduced environmental impact, is quicker and more efficient. The next phase of work will be the removal of the waste from the ponds for treatment and packaging. The ponds are expected to be completely emptied and drained by the end of 2019.